Every Knapheide crane body features their unique torq-isolator crane support system. The reinforced crane box transfers lift forces into the full-length torsion-box subframe and outriggers...not the side compartments. 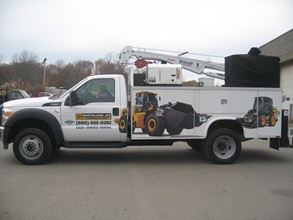 This commercial body is designed for all commercial SRW and DRW light duty chassis. The bodies are available in lengths ranging from 8' to 11'. All of the standard knapheide utility features. 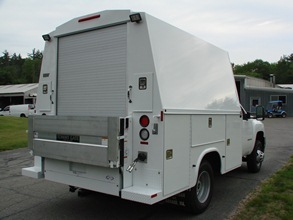 This commercial body is designed for both Ford and GM commercial cutaway van chassis. The bodies are available in lengths ranging from 129" to 181". KnapTight™ double panel rear cargo doors lock and seal into the body frame. These 20 gauge Galvanneal steel doors have nitrogen gas struts, slam latches, and have 9”x30” rear glass windows with guards. Two rear access doors with stainless steel latches on upper roof structure. Grab handle at right rear in cargo area. Aerodynamic wind deflector mounted on body above cab (all models except for the KUV129SUK). Knapheide's standard steel service bodies are available in many lengths to fit a variety of chassis wheelbases. Bodies are available for both single rear wheel and dual rear wheel vehicles. Each body is covered by Knapheide's 6-year limited warranty. Available in 700-series, 600-series, or 500-series compartment styles. Rugged 14-gauge two-sided A-40 galvanneal steel body shell. Complete immersion in electrodeposition gray epoxy prime paint. Knapheide's exclusive "return flange" floor design provides support for side compartments, adds floor strength and eliminates rust-prone exposed seam between floor and side compartments. Double shell, 20-gauge two-sided A-40 galvanneal steel hat section reinforced doors for durability and long life. Exclusive thick automotive bulb-type neoprene door seals protect compartment contents from weather. Exclusive all stainless steel continuous hinges. Double spring over center door closures on all vertical doors. Exclusive "Quick Mount" installation permits quick, safe mounting of body and bumper, allows easy transfer from chassis to chassis (meets FMVSS301 requirements). 250-lb capacity adjustable divider shelves. Knapheide's Westerner storage bodies are available in many lengths to fit a wide variety of chassis wheelbases. Bodies are available for both single rear wheel and dual rear wheel vehicles. Each body is covered by Knapheide's 6-year limited warranty. 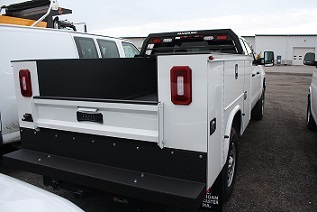 Rear cab protector with louvers to provide cab and window protection. Ladder rack design with two (2) built in tie-downs. CHMSL light included on 78" wide models. Cargo area work lights (2) - recessed for protection. Tailboard channels will accept 2" nominal lumber - lumber not included].